More Adaptable. Always Connected. Built for Global Business. Sovos S1 architecture does the hard work for you. The Sovos S1 architecture does the hard work for you – adapting to changes in technology requirements and government regulations – and giving you access to the tools and data you need to run your business anywhere in the world through a consumer-grade user experience. 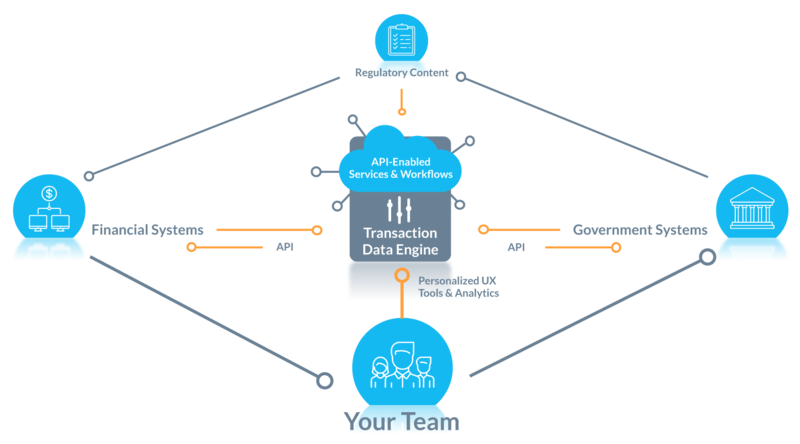 APIs make applications easily available in your specific set of financial systems and workflows – and allow your systems to communicate to governments in the unique and changing data formats they require. The engine centralizes all your data in a data warehouse, giving your business a single source of truth for all tax-related data, regardless of source system, and enabling data consumption by multiple applications. Our regulatory analysis team does the hard work for your business, updating all your applications behind the scenes through our content management platform, freeing your team from the work required to monitor, interpret and deliver regulatory content to your systems. The S1 user portal provides a single pane of glass into your business in a user-first design system, giving leaders access to the data they need – while simplifying the application for your team with a role-based experience. S1 drives your business workflow while enabling you to make better business decisions by allowing you to adapt to changes in your systems, regulatory environment and the technical requirements for tax reporting and electronic invoice compliance.